Today we take a look at my latest Reserveage Nutrition Wholeganic Greens review. This is the first time I’ve reviewed this popular green superfood drink powder. And honestly, it is a good one, although not good enough for my elite top 10 superfood green drink reviews list. Wow, that really made me sound like an arrogant prick. I apologize. That said, I don’t take back what I said. As this Wholeganic Greens review will show, this drink is a bit lacking in the value arena making it impossible to classify it alongside big monster green drink brands like Kylea’s Total Living Drink Greens. That said, Wholeganic Greens is good stuff made of superior ingredients by a company that’s not some fly by night production. With Wholeganic Greens, you could do a little better, but you could also do a lot worse. That’s really the summary of this green superfood drink review. Wholeganic Greens has four distinctive blends present in their green drink powder. The primary focus in on organically fermented grasses, including wheat grass, alfalfa grass, oat grass, and barley grass. This is a 4000 mg pop of three of the healthiest ingredients on earth. While the total is 4000 mg for all combined grasses, the primary and predominant ingredient is the barley grass. It is more than half of the blend. Wheat grass, oat grass and alfalfa grass each ring in with 600 mg a piece. Barley grass being the primary ingredient of the blend means you can get more calcium from this green drink than you could from a glass of milk. Barley grass is loaded with calcium. It also has a lot more iron than spinach. Oh, and it packs a heck of a B12 punch, something vegans can take comfort in as they often struggle to get enough B12 in their diet. Wholeganic Greens ingredients include some mainstay vegetables termed as “land vegetables.” This includes popular greens such as broccoli, kale and spinach. Those are rather no-brainer inclusions when it comes to superfood green drinks. Fiber, prebiotics, and probiotics top off this pretty solid green drink experience. Organic Barley Grass: As mentioned above. barley grass has five times the calcium that a glass of milk does. And it blows spinach out of the water with its iron contents. Additionally, it contains B12, which is tough to come by unless you are a meat eater. So you can pass on the steak when you drink a Wholeganic Greens every day. Organic Alfalfa Grass: This grass is known for having 8 amino acids in its chain. It is also known to be extremely anti-fungal and good for liver detoxification. Who doesn’t need an internal cleanse at least every now and then? Oat Grass: This grass is a protein punch. 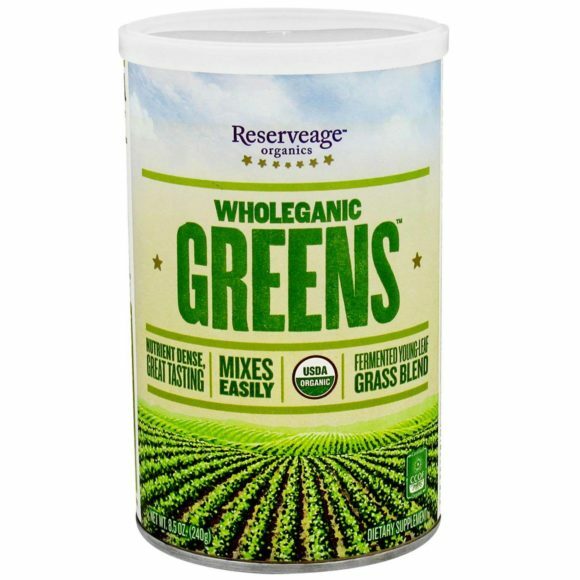 This addition makes Wholeganic Greens a decent player in the meal replacement game. Remember, proteins are not just for helping to build and sustain muscle, they also help us achieve a feeling of being satiated, which is code for helping us lose weight! Organic Spirulina: Spirulina is another great source of powerful protein. It also delivers a huge load of beta-carotene, which is great for the eyes. As noted below, Wholeganics Greens ingredients also have carrot powder, so your eyes will be in great shape with this green superfood drink. Organic Chlorella Broken Cell Wall: There is Chlorella, and then there is the broken cell wall version, which is way more powerful. Whenever you are looking at green drinks which contain chlorella, you always want to make sure it is the broken cell wall version. The minerals and vitamins present offer way more pop when they come from this version. This is a great Wholeganic Greens ingredient addition. Organic Kale Powder: Kale is one of the most agreed upon superfoods of all time. The five grams of fiber per serving are incredibly healthy for your digestive experience. Folate and magnesium are just two of the vitamins and minerals that your body receives when you take down calcium. Kale isn’t that tasty, which is why its great to get it in a green superfood drink. Organic Broccoli Powder: When I think of the benefits of broccoli, I always think first about vitamins C and K. Getting vitamin K in your diet isn’t always that easy, and vitamin C is usually found in sugary fruits. Additionally, it helps you with collagen support, which is amazing for skin and bones. Organic Spinach Powder: Think Iron, lots of iron! Organic Carrot Powder: Beta-carotene is amazing for your eyes! The older you get, the more you need to consider your eye health. Organic Chia Seed Powder: These seeds are loaded with Omega 3 fatty acids, so not only are they a great fiber source, but they also offer similar fat profile benefits to salmon. Chia seeds health benefits are mighty huge! Organic Inulin Powder: This is an amazing prebiotic. Wholeganic Greens also offers a probiotic blend, so having prebiotics like inulin powder means that those good probiotic enzymes have good bacteria to feed on. Protease, Amylase, Bromelain, Cellulase, Lactase, Lipase: 85 mg of solid probiotics that would cost you a fortune if purchased individually at a supplement store. Wholeganic Greens taste is surprisingly, not bad. Why? Because you mostly won’t taste it. The combination of organic ingredients seems to neutralize what you would predict to be a rather soil-laden taste profile. But that’s not the case. And being that it is primarily a tasteless experience, this means you can mix it with fruits as a way to give it a more exact preferred taste. At 7 grams per serving, one container has 34 servings, at $40 / container comes to $1.20 average cost per serving. Make no mistake about it, Wholeganic Greens offers a lot of value. This is a good superfood drink. But when we assess value, we certainly can’t call it one of the top 10 superfood green drinks. I honestly think you’d do a lot better with Garden of Life Perfect Raw Food which rings in at less than a buck per serving, or Kylea’s Total Living Drink Greens which, although the new kids on the block, have a super powerful blend that’s really affordable considering the wealth of amazing greens you get. Wholeganic Greens just can’t reasonably be placed into my top 10 superfood green drink reviews, but that doesn’t mean it isn’t a good green drink experience. It comes up short on value, but not on quality. There are a lot of powerful ingredients in Wholeganic Greens. If you already have purchased this drink, don’t fret, you have a good one. You just don’t have the best value one. In other words, you overpaid, a slight bit. Can you live with it?